Trump promised to donate $1 million to Harvey relief efforts—while dismantling the government we all rely on. The map of disasters is immense, and the suffering often anonymous. As I write, firefighters are battling a blaze that has spread across huge swaths of dry land in the San Fernando Valley, 15 miles north of my home in Los Angeles. Monsoon rains in Bangladesh, India, Nepal, and Niger have resulted in the deaths of over a thousand people. Mudslides in Sierra Leone claimed 500 lives, and many victims are still missing. And in Texas and Louisiana, Hurricane Harvey caused flooding and devastation on a scale rarely seen on the Gulf Coast. Faced with calamities like these, the natural human impulse is to ask: How can I help? We’ve already seen heroic answers to that question in the aftermath of Harvey. Texans volunteered at shelters and food banks, donated bottled water and supplies, and searched for survivors in flooded neighborhoods. Several Houston-area mosques opened their doors to evacuees. Jim McIngvale, a local businessman who calls himself “Mattress Mack,” turned his furniture stores into shelters for those in need. The Cajun Navy, a group of volunteers from Louisiana, brought their boats across state lines to assist in rescue efforts. And reporters rushed into the eye of the storm to bring us the news. But while these stories inject us with hope, we must also ask why volunteer efforts are so desperately needed in the first place. This performance was widely criticized, so Trump flew down to Texas on September 2 for a do-over. 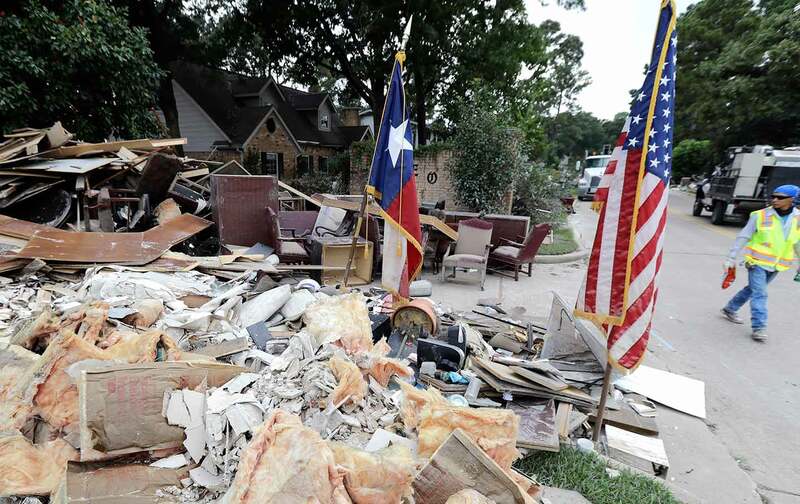 This time, he went hatless, met with people at shelters, hugged a few children, and vowed (via Twitter, of course) that “we will prevail in the GREAT state of Texas.” He also pledged to donate $1 million of his personal fortune to hurricane-relief efforts. Whether any of that money will actually be paid remains to be seen. Trump has—how shall I put this?—a mixed record on charity. The Washington Post’s David Fahrenthold reported on several cases in which Trump didn’t come through on his pledges, or else paid them through the Trump Foundation—which is to say, with other people’s money. But Trump’s financial pledge can’t make up for what he has done to the government’s disaster-relief agencies. The Federal Emergency Management Agency had no administrator between January and June, when Brock Long was finally sworn in as the new director. Furthermore, Trump’s proposed 2018 budget includes $667 million in cuts to FEMA grants that help cities and states prepare for disasters, as well as a 32 percent cut to NOAA’s Office of Oceanic and Atmospheric Research, whose scientists study environmental phenomena such as (you guessed it) hurricanes and tornadoes. These and other budget cuts are being made in order to provide initial funding for Trump’s border wall. Of what use is a border wall to people who are drowning? This question should be asked of all Republicans who are going along with Trump’s upside-down priorities, even though they are well aware that his “beautiful” wall is costly, inhumane, and ineffective. As the floodwaters rose in Houston, many people rushed to help, including people targeted by Trump’s immigration plans. Alonso Guillen, a 31-year-old beneficiary of DACA (or Deferred Action for Childhood Arrivals, the policy that provides relief for the children of undocumented immigrants), drowned while trying to rescue others. Jesus Contreras, another DACA recipient who was brought to the United States when he was 6 years old, continues to work as a paramedic in Houston. But now that Trump and Attorney General Jeff Sessions have announced the “orderly wind-down” of DACA, Contreras and 800,000 other young people could be deported, perhaps as early as March of next year, many to countries they’ve never lived in. When they return from recess, members of Congress will face the task of voting for federal relief to survivors of Hurricane Harvey. Ted Cruz, who built his career as an advocate of small government, says he hopes he can count on bipartisan support for relief to his state. But it’s worth remembering that 23 representatives from Texas, including Senators Cruz and John Cornyn, voted against Hurricane Sandy relief in 2013. There are no atheists in foxholes, as the saying goes, and I am tempted to add that there are no small-government advocates in hurricanes. We may not be able to prevent natural disasters, but we can prepare for them in a variety of ways, including through proper funding of scientific research and agencies like FEMA. This is the work of the federal government, which Trump and his Republican enablers seem so intent on dismantling.